A Lesson Ignored in "Conduit 101"
THE TRANSPORTATION SYSTEM: EFFICIENCY OR EFFECTIVENESS? A Living Trust as a "Big Idea"
If we want a world of true social-environmental quality to live in, we must change our materialistic values and habits-and be persistent in that change. We must reach beyond where we feel safe and dare to move ahead, despite the fact that perfect knowledge will always elude us. There are no biological short cuts, technological quick fixes, or political hype embodied in our current symptomatic thinking that can mend what is broken. Dramatic, fundamental change in the form of systemic thinking is necessary if we are really concerned with bettering our quality of life-even that of next year. Social-Environmental Sustainability is a series of books designed to examine our human-caused, global problems in terms of nature's biophysical support systems and to propose sustainable solutions that will move society toward an ecologically sound environment and a socially just culture. As such, each book in this series will be thoughtfully selected because it must add a new dimension to the resolution of our problems-not just repackage old ideas. My purpose in writing this book is to help people comprehend the commonalities and reciprocities among the biophysical patterns and functions that activate and maintain Everyforest and Everycity. With this understanding, people can determine what they can do to personally leave this magnificent planet a little better for subsequent generations, while simultaneously improving conditions for themselves. After all, Earth is a biological living trust, of which we, the adults, are the immediate trustees. In turn, the children of today, tomorrow, and beyond are the beneficiaries of our decisions and actions, which become the circumstances of their lives-and we allow them no voice in the decision-making process. "The book provides an important and unique perspective on the strong relationships and parallels between human-made systems and structures and other natural systems and structures. The convergence of the social and physical sciences; of science and spirituality; of art and science and of other previously isolated fields of endeavor and belief will be, I believe, the hallmark of this century. Chris's book elegantly weaves together two such realms of thought and understanding. I have been an urban planner since 1971 and have read many books relative to planning and development. I have not yet read a book or article, which provides this much-needed framework for planners, public officials engaged in community development, and systems thinkers. I believe this book will make a significant contribution to the existing conceptual frameworks used by urban, regional, and natural resource/environmental planners while laying the groundwork for an emerging multi-dimensional, multi-disciplinary, highly integrative thought system. "—Jane Silberstein, Bainbridge Island, Washington. "I've been assigned to index your new book for Taylor and Francis. I just wanted to let you know what a great pleasure it has been to READ your book as well as index it. I truly appreciate how you bring together insights from philosophy and literature to bear on the ecological worldview. Now, if only we could get policymakers in Washington to have the same profundity of insight!!! "— Sybil Ihrig , L.Ac., HMA, San Marcos, CA. "With the environment, climate change, and global warming taking center stage in the national debate, the issues seem insurmountable and certainly unsolvable at the local level. Written by Chris Maser, international consultant on forest ecology, sustainable forestry practices, and sustainable development, Social-Environmental Planning: The Design Interface Between Everyforest and Everycity focuses on community based solutions, emphasizing how the heavy lifting of sustainability will always be done inside existing cities and communities. Based on the author's forty years of experience, the book covers the sustainability of the planet and its population when dealing with climate change. "The book provides an in-depth understanding of the commonalities of pattern between Everyforest and Everycity. Maser suggests that before changes can be made, society must adapt to the circumstances of global climate change as they already are, and then determine what we can do to stabilize global climate as effectively and quickly as possible. He explores the reciprocal interface between communities and the landscape and how, when this interface is recognized and understood, it can create solutions that work. With this comprehension, people can adapt to the present and begin determining what they can do now to leave the planet a little better for each generation. "—Wageningen UR Library Catalogue. "Social environmental planning: The design interface between everyforest and everycity explores the sociological and structural relationships and interactions between nature, culture, and urban environments in the face of global climate change. Using a charismatic discourse and witty convictions, Chris Maser argues that the functionality of nature's design can be and has been used as a guiding framework to build human communities. He draws parallels between the forest as a complex bionetwork and the built environment. He illustrates the similarities in social decision making processes, cause, and effect tendencies, and the spectrum of colour invoked through arts and culture for humans, as compared with nature's aesthetic appeal and displays (xvii). Maser weaves in the concept of narrative: '[w]e humans compose the broad shapes of a cultural storyline by using words to convey colours of meaning we mix on a palette of syntax' (xvii). He stirs a melange of hard scientific spice, design savvy, and sociological criteria in contrasting a forest with a city. "Maser introduces the human dimension, discussing perspective, personality, and motivations. He relates language and communication to how humans experience, acquire, and process knowledge. He outlines a 'frame of reference' and illustrates variances in our perceptions of truth based on cultural evolution. Finally, he weaves this into our potential for interpersonal cooperation and communication in moving towards a sustainable future. Maser then maps 14 biophysical principles and offers suggestions for application through design methods. These principles outline the commonalities and fundamental tenets of relationships and of how the world functions or operates: flows of energy; constancy of change; the interdependency of systems; and, the cyclical dynamic between structure and function. Here, Maser contrasts 'everyforest' with 'everycity' through closer examination of design elements, such as composition and constraints; habitat components, such as boundaries and access to resources; landscape patterns; and infrastructure. His chapter on infrastructure echoes the concept of urban metabolism (Heynen et al. 2006) and systemic interplay through which humans attempt to control, bend, and shape nature in community design. Maser's most interesting observation is that landscape patterns 'give visible expression to the heretofore-unseen desires that reside in our human psyche' (p. 102). Maser's ability to bridge scientific theory with social psychology is compelling. "Identity is comprised of both the natural and constructed environment, which centres around shared relationships and values. The three central tropes here include: cumulative human effects; age as historical archive; and, the relationship between ecology and economy. Maser argues 'psychological maturity, which equates to mental/emotional health, is our capacity to recognize and account for what best serves the whole in any given situation' (p. 235). The concluding part of the book serves to contextualize social environmental planning at the microscale. Sustaining the quality of life, ensuring human health, and moving away from global social and economic polarity have become major considerations in urban planning over the past decade. Maser suggests that a shift in social wealth will lead to social parity (p. 221). He outlines here the basic concepts of and challenges facing environmental planning, which include interpersonal connections, renewed commitment, and effective leadership. "Not since Jones and Cloke's Tree cultures: The place of trees and trees in their place (2002 [Oxford, New York, NY]), and Konijnendijk's The forest and the city: The cultural landscape of urban woodland (2008 [Springer, Dordrecht, Germany]), has there been a text so comprehensively bridging urban nature, human culture, and structural process. Maser challenges his reader to set aside common assumptions about placing blame, for example with respect to environmental degradation, on one aspect or component of society. Instead, he suggests that the system must evolve collectively. Through practical logic, scientific explanation, and unparalleled social insight and intuition, Maser breaks down stereotypical absolutisms in environmental management planning. "Social environmental planning sets out to establish new ways of examining and understanding the relationship between nature's processes and the design of human communities. It is, however, weak on looking at social divisions among humans, where readers expecting an exhaustive theoretical analysis will be disappointed; Maser could here be profitably read against some of the urban political ecology literature (Heynen et al. 2006 [ In the nature of cities: Urban political ecology and the politics of urban metabolism. Routledge, New York, NY] ). 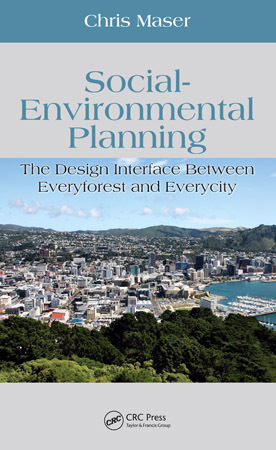 However, the book offers excellent insight into the relationships, functions, and paralleles of forests and cities; human behaviour; and also management planning strategies. Set against the backdrop of global climate change, this book reinforces the idea that thinking about green nature in relation to urbanization processes is integral to developing sustainable communities in the interest of human health and quality of living. "—Adrina Bardekjian The Canadian Geographer, 56 (2012):385-386.